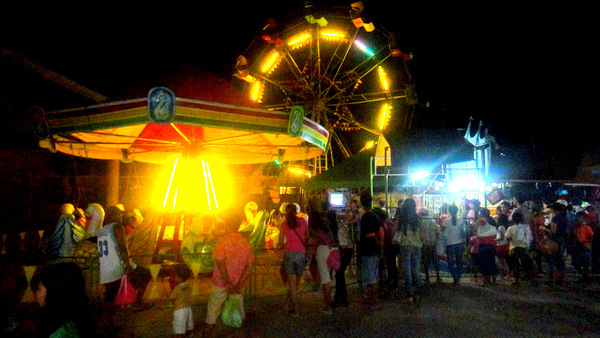 Carnival time at last month’s Manggahan Festival in Guimaras. Visions of rides, games and junk food danced in the heads of our nieces and nephews. Tita (Aunt) Daday and Tito (Uncle) Dave promised the kids plenty of fun during the annual mango mash, and they weren’t disappointed. 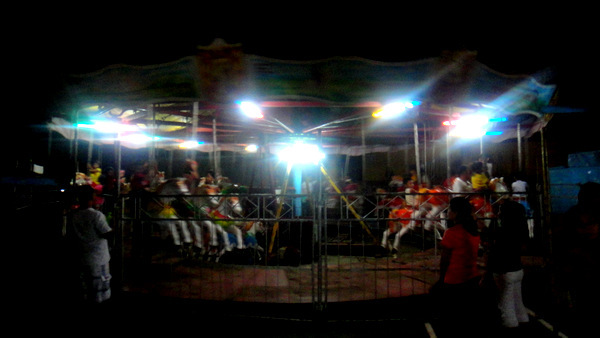 Triple M, a private company that operates carnivals throughout the Philippines, was in charge of the concession area and charged a P5 (12¢) admission fee and P20 (49¢) per ride. Triple M ran three rides for the annual mango mash. 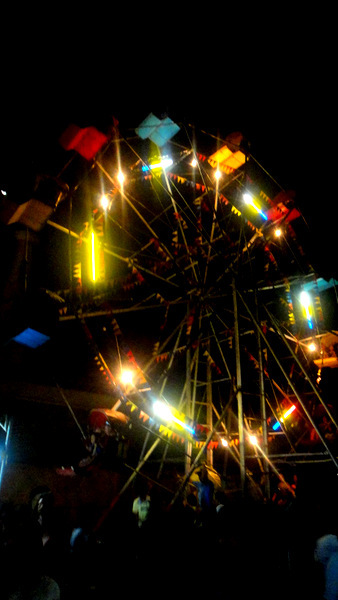 The Ferris Wheel, shown below, was one of them. Every good carnival needs one. No way you’ll see this American expat living in the Philippines get on this contraption, however. Rode one at the Chatham, Illinois, Homecoming about 20 years ago with an attractive young blonde I had recently met. I got sick. Really sick. Had to excuse myself and could barely drive home. Needless to say, there wasn’t a second date. Worked out because years later I met my beautiful asawa, The Sainted Patient Wife. Next up is the Merry-Go-Round. Our niece, JalAmiel, and her brother, Jorreal, love this ride. JalAmiel, now five years old, was OK riding it by herself. It makes me dizzy watching the thing spin around. Drinking too much Red Horse has the same effect. 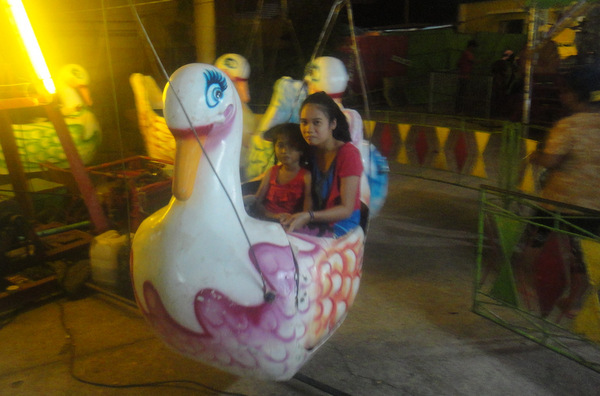 Our niece JalAmiel (on the left) was on the Swan Ride with her cousin Shaina in the next picture. Amiel needed a companion on this ride. Shaina is almost smiling. She’s been staying with Lola (Grandma) and our brother-in-law Joery and sister-in-law Alida during school vacation. Maybe time away from dictatorial Uncle Dave explains the happier mood. Shaina likes hanging out with her cousin, Den Den (Joery and Alida’s 12-year-old daughter) but Sharwen, her brother, who had also been “vacationing” at our home in Guimaras, “The Compound,“ returned to our subdivision home in Iloilo City about a week or so ago. He was getting bored. As quiet as our nephew is, I barely notice him around the house unless he gets in my way. The shy Sharwen doesn’t let that happen too often. 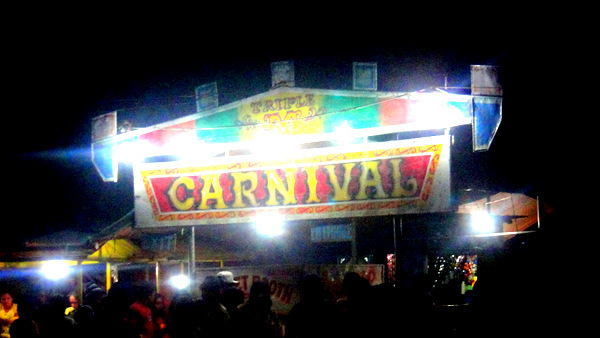 Quite a few carny games at the mango festival plus a karaoke machine (shown in the next photo on the right.) 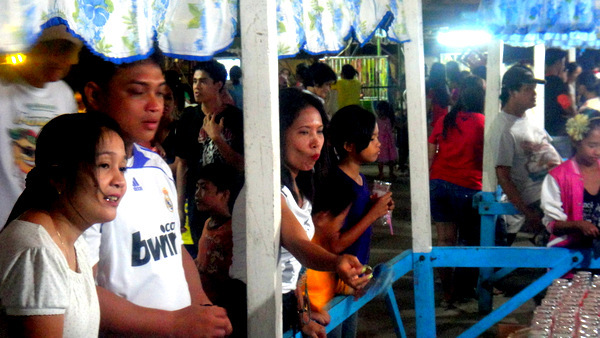 A couple stands also sold snacks but the best food kiosks were outside of the carnival area. I’ll be doing a “Best and Worst” feature of the Manggahan Festival and will feature some of my favorite eateries at the big provincial party. Here’s a look at another carnival game at the big bash. 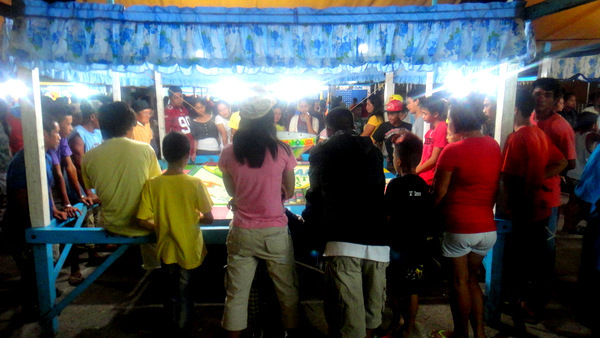 Most games had plenty of Filipinos surrounding them where a person could win prizes or gamble for cash. Saw very few foreigners at this year’s festival. Aside from my American expat friend, the Tom Cat, I only saw one older foreign couple one day out of the four days we spent there. In the picture above is the Tom Cat’s girlfriend, LenLen (center with her hand outstretched.) She’s gambling. I believe my American expat friend, Tom, advised me LenLen had dropped 80 pesos on this game. Good chunk of change in the Philippines. Could buy a couple of bottles of San Miguel Pale Pilsen at Manggahan for that and still have 10 pesos leftover. 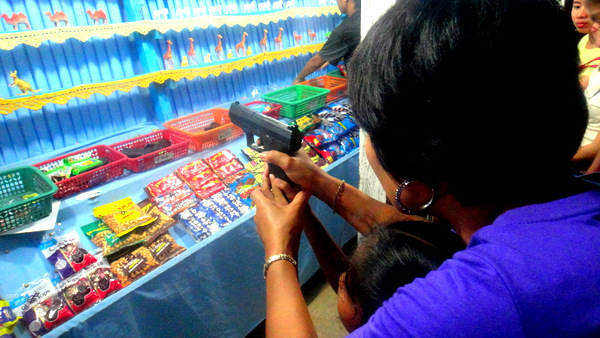 Here’s my beautiful asawa helping our five-year-old niece take aim in this shooting game, drawing a bead on a kangaroo. This was the first place JalAmiel wanted to go, even before the rides. 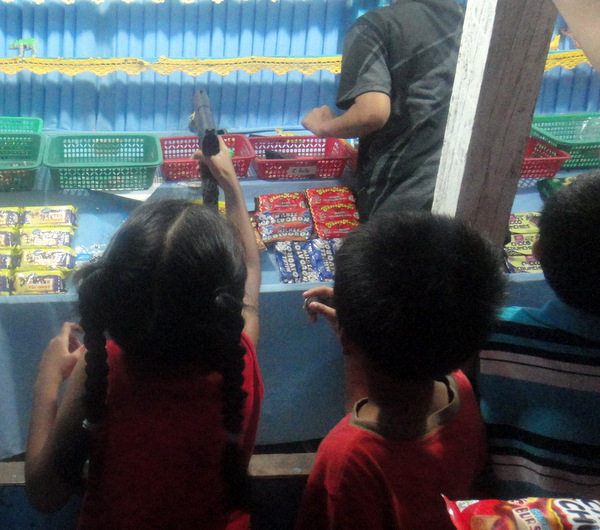 She spent a lot of time and money (20 pesos for one load of 10 shots) trying to win snacks that she could have bought much cheaper if she would have paid for them outright. But that’s what makes a carnival fun for the kids and profitable for the operators. JalAmiel is shown in the picture above cocking the gun. This had to be done before any firing of the pistol could begin. My little niece should be a poster child for the NRA back in the States. 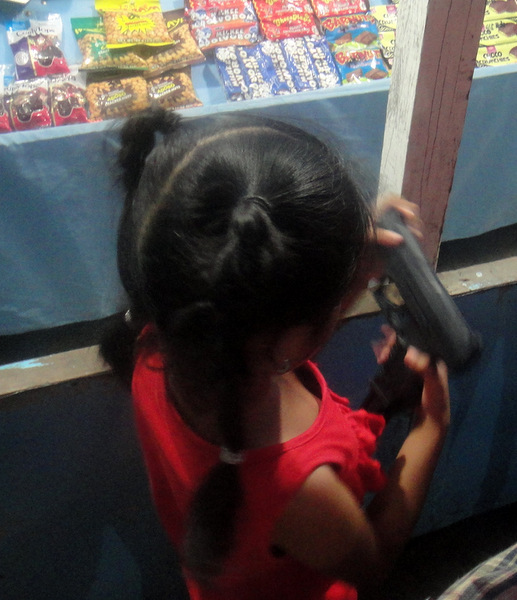 Here’s the little sharpshooter taking aim at one of the targets. Brother Jorreal is standing next to her hoping to get a turn. He didn’t get many. This is a look at the carnival midway at night. 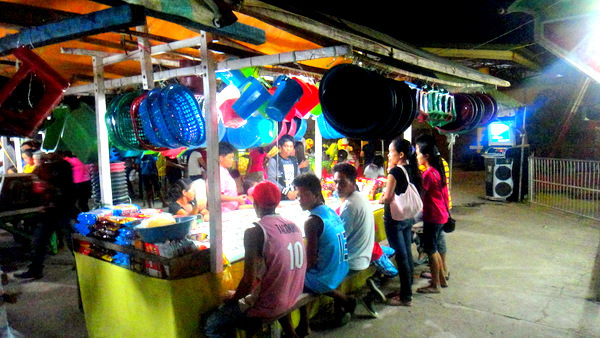 The Manggahan Festival is the biggest party of the year in the mango province of Guimaras. Lots of fun and a big treat for our nieces and nephews. What kid growing up in the States doesn’t have fond memories of their own town’s homecoming or state fair? I sure do. And now our extended family in the Philippines will have some, too. As will their Tita Daday and Uncle Dave. And yes, the date didn’t turn out well. But now I’m married to a sweet, lovely Filipina (who’s a great climber.) I’m one fortunate guy. I bet you’re excited, PapaDuck. Wow! Anne will be there soon and only 4 more working days for you. I remember my count down after almost 30 years with AT&T. It’s an exciting time in your life and congratulations. Couldn’t happen to a nicer guy. Looks fun and really who needs to get dizzy on rides when drinking a few beers does the same job and you have more fun too. I Sure do wish that I was there for the Festivities ! We sure missed you, Frank. I had to hang out with your old high school buddy, Tom. I’ll be featuring my misadventures at the festival with “The Tom Cat” in a future post. Take care. This story brought back memories for me of the old carnival rides at the Surfside Beach S.C. pier and the Pavilion at Myrtle Beach. I’m not a big fan of these kinds of thrills myself. I rode the looping roller coaster once. Once mind you. And that Ferris Wheel seems harmless. Until they stop you at the top to let on other riders. With that cart rocking back and forth I just wanted my ride time to be up, before life is up. Andrew, my Dad tells me the story of riding the Ferris Wheel when he was a teenager back in Illinois many years ago. Dad would deliberately rock his seat when the wheel would stop at the top. Of course he was trying to scare the young lady who was seated next to him. That young lady ended up marrying Dad. Mom told me that Dad was successful in his attempt to scare her. Glad the story brought back some good memories for you. That’s funny, Gary. 😀 I’m going to make sure I stay away from any Ferris Wheels at future festivals.